Do you know what our new favorite printing tool is? Flower pods! After viewing my scissor stamp, Shalet informed me that her daughters had discovered the brilliant beauty of stamping with Asian Poppy pods. I remembered how gorgeous my poppies had looked in early July after the petals fell away. In fact, I had snapped this picture, because I was so inspired. I thought that I might use the photo for a future print of some kind. Never did it cross my mind to print with them!! I ran out to grab a few. They were too dry, and the rays of their little sun had begun to rise and lift off the pod. So disappointing! I sure hoped I'd remember next July. A few days went by, and I happened to be at Laura's house, where her Asian poppies were just finishing up. Her's were the pinks, mine were the early crimsons. She gladly let me snip some, and my girl and I went running home for our stamp pads. As you can see we stamped on paper and cloth... well, wait until you see the rest! So good... so fun! I'll be back with more details and photos, but we're about to have a huge summer storm, and I'm off to batten down the hatches! Hope your week is off to a great start! Hope your storm is not to bad! Margie seams to have lost her power do to a storm today. Great idea! Such a pretty, delicate design. So lovely - thank you for sharing this with us. That's a fun idea. Never would have thought of it. It opens a whole new world of possibilities! i guess we were both printing with nature between the storms yesterday. We lost power at 6 for about 8 hours. It was a very quiet peaceful night for sleeping. 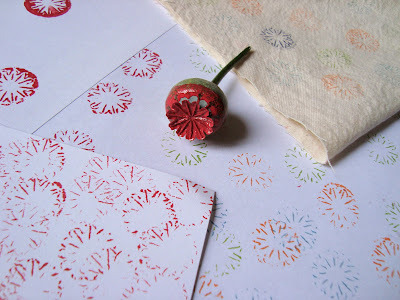 LOVE the pod prints - a fusion of 2things I love; pods and the look of asian paper/fabric. I can't wait to try it. 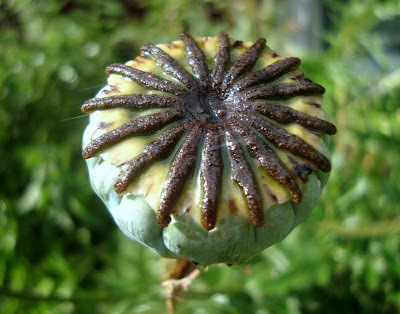 I don't have any Asian poppies, but I wonder if this would work with velvet leaf (a wildflower we have in profusion) pods. I usually bring them in for flower arrangements once they're dry, but the still green pods might work for printing. Thanks for the idea! Brilliant! I still have some poppies growing in my gardens. Yeah! My girls will be so happy when I tell them! Happy stamping! I think I may have a few not too dried out to try this so thanks for the idea! I love poppy pods. If you get lucky and they are still standing in the winter, they skeletize and become like really small bird cages. I had one once, cherished it, and then the cat found it. Aw, shucks! They are beautiful from start to finish, aren't they. The prints are dainty and sweet! Adorable. Now to find that tree or bush around here! Great idea!!! Makes me want to use pods of other types as well. Thanks for sharing. brilliant idea! i'd love to try this with my kindergartners. You girls are so CLEVER! I'm totally going to do this. We have things blooming all year round-I can't believe I haven't thought of it yet! Beautiful stamping - what a great way to capture and appreciate more of nature's beauty (and, my husband the math teach would note, nature's geometry). I'm longing to make some stamps, but don't really want to shell out for fancy lino carvers. Can I use a paring knife or is that just asking for a finger lopped off? Miranda, the lino carvers are so worth the investment... and a paring knife, besides being super dangerous, just won't afford you the detail possibilities.